All too often its as if two ships seem to have come parallel to each other, not realizing that they are actually on a very slow course to collision. They don't notice because they notice the way their specific need is met by the other at the moment, rather than how it will not be met in the future if the mutual selfishness that brings them together prevails. The mutually self-interested moment that brought them together is what leaves bruises on each other when the banging up against each other happens. And it will happen. If the only goal was coming together, then there is no remaining momentum to help them continue aligning once they have begun and begin to learn what it really takes to make their common enterprise work. Getting renewed and ongoing alignment is usually more complex than reading the legal language in the franchising contract! Thankfully there are ways to work at this conceptually that provide wise guidance. Its graininess is proof that it has been around for awhile! 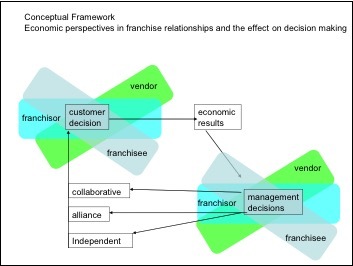 It essentially draws on Luft's Zucchini Connection to demonstrate that the ongoing viability of a franchised arrangement (or any other form of coming together to launch an enterprise) begins with a commonly derived understanding of the customer/client decision. The economic result (benefit OR harm) becomes a new reason for a franchisor, franchisee, and even vendors with whom they must work, to strategize and strengthen the organization they build and adapt together to continue meeting the customer's need. When the customer's need is not considered and mutual self-interest replaces it, then customer need and positive economic results are ditched, along with the partnership of organizations originally formed to meet it. Consultants connected to Convene understand organizational complexity, and are prepared to help you build toward alignment and execution. We’d love to hear how we can help. Mark L. Vincent (PhD, CCNL) is the Director of the Convene Consulting Network. He is also the CEO of Design Group International, an organizational development company providing wise guidance for enterprise, nonprofits, and ministry organizations. His passion is to love leaders as they claim their life vocation as stewards of enterprise. Older PostAchieve Perfection or Pursue Excellence?